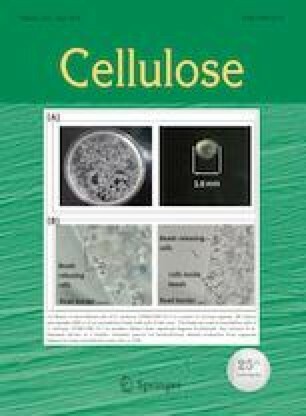 Cellulose micro-fibrils (CMF), which are green, sustainable and are made from abundant renewable biomass, have attracted much attention in the research community for various applications. In this study, we presented a novel magnetic cellulose composite catalyst (HKUST-1/Fe3O4/CMF) for pollution remedy purpose. The main function of CMF is to improve the dispersion of metal organic framework (MOF) crystals (HKUST-1) and Fe3O4 nanoparticles (NPs) so that the catalytic performance of resultant HKUST-1/Fe3O4/CMF composite is enhanced. The as-prepared HKUST-1/Fe3O4/CMF catalyst was characterized by TEM, EDX, BET, XRD, FTIR, TGA and VSM analytical techniques. Results have showed that HKUST-1 and Fe3O4 NPs are anchored onto the surface of CMF. The adsorption efficiency of HKUST-1/Fe3O4/CMF composite has enhanced because of the porous MOF structures. Furthermore, the composite catalyst has a large surface area and exhibits good magnetic and catalytic properties in the Fenton system. When used as a catalyst in the degradation of dye model compound (methylene blue, MB), the composite catalyst shows a high catalytic activity. In addition, the composite catalyst reveals a good reusability, durability in the recycling and reuse testing. These results support to conclude that the as-prepared HKUST-1/Fe3O4/CMF composite is a green, sustainable, effective and potential catalyst system for pollutant remedy. The authors acknowledge the financial support from (1) the National Natural Science Foundation of China (31570576), (2) the Natural Science Foundation of Jiangsu Provincial University (16KJA220005), (3) the Postgraduate Research and Practice Innovation Program of Jiangsu Province (KYCX17_0835), (4) the Doctorate Fellowship Foundation of Nanjing Forestry University, (5) the Priority Academic Program Development (PAPD) of Jiangsu Higher Education Institutions, and the Canada Research Chairs program of the Government of Canada. Also, the authors acknowledge Mr. Mike Johnson (Department of Chemistry and Institute for Research in Materials, Dalhousie University, Halifax, NS, Canada) for the acquisition and interpretation of the PPMS data.